Regular aerobic activity plays an important role in both helping keep your weight under control and increasing your overall health. In fact, regular exercise using equipment like a treadmill will not only help you lose weight, but also might reduce your risk for diseases and health problems like heart disease, diabetes, arthritis and even some forms of cancer. To experience these benefits from a treadmill, spend the recommended amount of time on the machine. Treadmills work by mimicking the actions of walking, jogging or running outside. Since treadmills are indoors, you have the benefit of being able to start and stop whenever you want without having to backtrack to where you started. You also can exercise at any time, regardless of the weather or light level outside. Treadmills allow you to ease the monotony by changing the intensity of your run or walk with speed controls. Many models also include an incline feature to offer hill workouts. The higher the speed and incline, the greater the amount of calories you burn. The Centers for Disease Control and Prevention has set out specific guidelines on how much physical activity adults should aim for to stay fit and healthy. 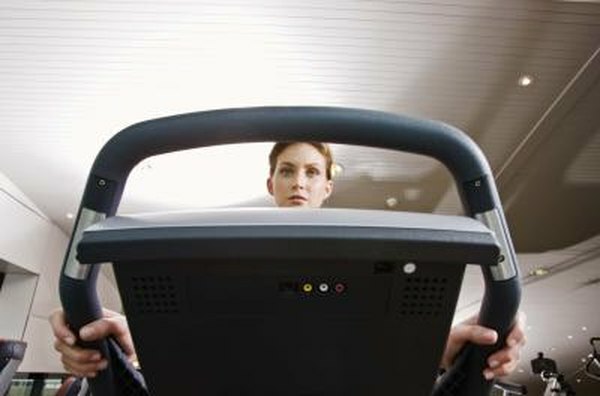 Use these guidelines to determine how long you should use a treadmill for the results for which you are striving. At a minimum, the CDC recommends spending at least 150 minutes a week performing moderately intense exercise. This can be achieved on a treadmill by using the machine 30 minutes a day, five days a week, but the time can be distributed in whatever works best for you. To speed up weight loss or create a vigorously healthy body, the CDC recommends increasing your exercise time to over 300 minutes a week. This translates to spending an hour a day, five days a week on the machine. You also can improve your results by increasing your intensity level, which also allows you to reduce the amount of time back to 150 minutes a week. To decrease the time, your exercise must meet the guidelines for a "vigorous-intensity aerobic activity," meaning that your heart rate has increased significantly. This can be achieved through running or even jogging on the treadmill, depending on your fitness level. When deciding how long to stay on the treadmill, pay attention to any signals your body is giving you. Signs such as feeling light-headed, dizzy, nauseated or pain of any kind mean you should significantly decrease your intensity or stop until the symptoms subside. If these symptoms become a regular problem, see your doctor to ensure your physical activity goals are appropriate for your health and fitness level. In addition, stretch after your treadmill workout to minimize muscle soreness and maintain flexibility in your legs, hips and back.